Q. How to recover a train with electric traction struck in neutral section? or using flash light signal. Upon getting such a request section controller sends the key of the isolator through the first available train and then using this key isolators are closed, thus energizing the neutral section. After that electric locomotive is passed through that section. loco pilot mandatorily needs to give in writing the section controller the reason why loco got struck in the neutral section. After passing of loco through that section , again the electric supply is put off using key of the isolator, locked back and key returned back to the station master of next station, who in turn sends it back to section controller. 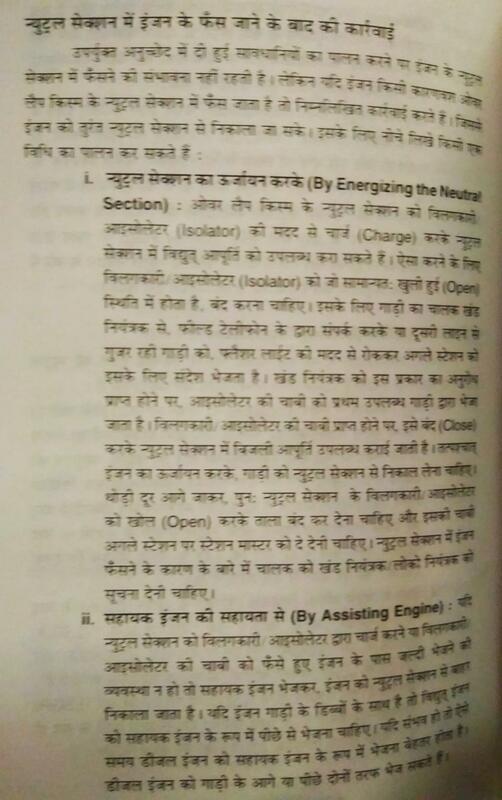 ii) When there is no provision to send key of isloators to the loco struck in the concerned neutral section, assisting loco is sent by nearest locomotive trip shed in charge to pull out the electric locomotive struck in neutral section. Diesel locomotive is preferred in all such rescue operations. 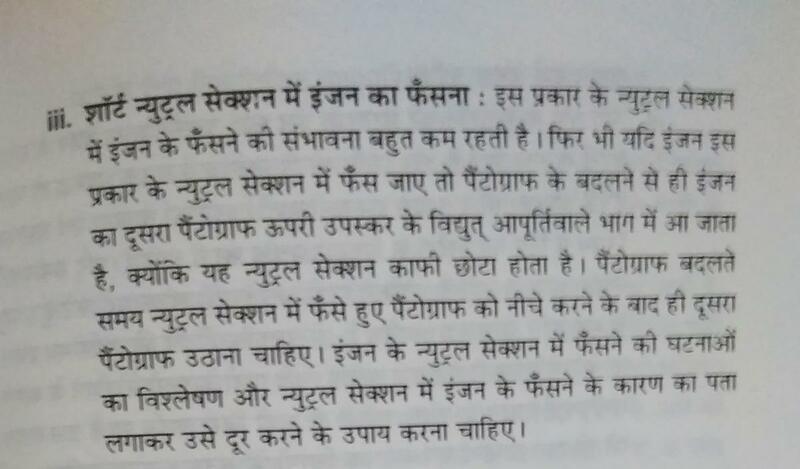 If the struck train has passenger bogies behind /in it then rescuing locomotive is sent from behind the train to give banking traction push to the struck train. iii) Short neutral section : chances of a train strucking in such neutral section is very less and even if it happens , an eloco can easily recover from it by getting its working panto down and rising up the alterior pantograph of the loco. By doing so only, panto comes under OHE with electric supply as length of such neutral section is few meters. It should be taken care by LP that the other panto is risen only when the other is in flag down position.